You strongly emphasize the musicality of spoken language in your collection River Hymns, as well as in your forthcoming poems in the Arkansas International— something that immediately drew me to your work. In River Hymns, sound and musicality are not only expressed through your use of language, but through your use of allusion, ranging from Big Bill Broonzy, to Sam Cooke, to Whitney Houston. Certain musicians are frequently associated with the speaker’s family members. How does the sound and musicality of language (and of music in general) inform your craft? How does this deepen your poems, especially in terms of music’s connection to the various people that recur throughout your work? I am attracted to music as a craft tool. I want my poems to have the tone of a Nina Simone song or a Sam Cooke song. I tap my foot or finger through a poem just like I would through a song. It allows me to hear the music in the language better. Poets don’t have a piano to accompany them so I find tone through word choice and voice. Over the holidays, I was driving to visit a friend in North Carolina. I took a bridge over the Neuse River, and was immediately reminded of your poetry because of how intimately connected your work is to this particular locale—Youngsville, North Carolina and the Neuse River. As someone who has lived along southern rivers for most of my life, your connection to this particular landscape has continued to fascinate me. What was it like growing up in this area? How does this inform poems like “Ode to Small Towns”? Growing up in the south among my aunts, uncles, and cousins made me into a poet. I come from a family of storytellers and folks who enjoy mining a family history. Of course growing up in the south or anywhere in America has its issues, but my family is strong and prideful so loving my blackness was something that was ingrained in me at a young age. I spent my youth walking far into the woods and getting lost for hours. So I have a long list of images to choose from. “Ode to Small Towns” is a celebration and a rebuking of those days in Youngsville. How does this connection to a very specific place tie into the idea of inheritance that you explore in poems such “Sore” in River Hymns? I think that the speaker is inheriting a connection to the earth in the poem “Sore.” I think they are also inheriting this celebration of one’s body through the form of the “cookout.” The speaker is also inheriting substance abuse in the form of alcoholism. What have you been reading recently? What’s really blown you away? I’ve been reading Aracelis Girmay, Dorianne Laux, Rita Dove, Jericho Brown, and Tim Seibles. I love going back and reading poets I’ve read before: it’s like putting on your favorite album. My second book of poems Cardinal (Copper Canyon Press) will be published in 2020, so right now I am tightening and reordering the book. I am just returning from the Palm Beach Poetry Festival where I got to take a workshop with Aracelis Girmay. Aracelis’ workshop pointed out a path to walk that I’ve been lost looking for. I am very excited for these new poems. DAVID BRUNSON is a poetry MFA candidate at the University of Arkansas. He serves as outreach director and assistant poetry editor. 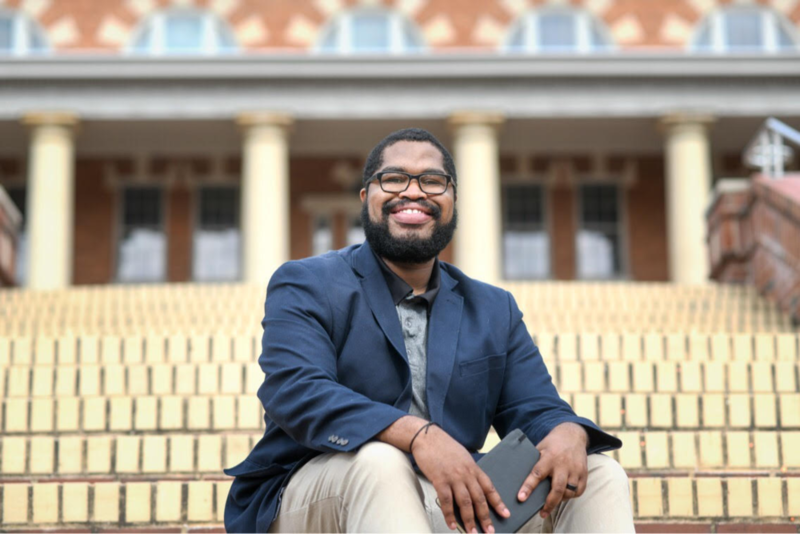 He graduated from Virginia Commonwealth University in 2016 with an English BA and a minor in Creative Writing.